Editor's Note: Since this review was published, Sonos has renamed the product the Play:5. Click here for our review of the 2015 iteration of the Sonos Play:5. I’ve made no secret of my love for the Sonos Multi-room Music System ( ), a system designed to let you listen to your music all over your house. It’s the musical gadget I use most often in my home. But it’s not cheap. To get started you need at least a $349 ZonePlayer 90 and a pair of powered speakers. And if you want a way to control the system apart from your computer, you require either an iPhone or iPod touch with the free Sonos Controller app or a $349 Sonos Controller 200 hardware controller ( ). Sonos is attempting to bring down this cost of entry with its just-released $399 ZonePlayer S5, a totable, table-top unit that's the first ZonePlayer to offer integrated speakers. 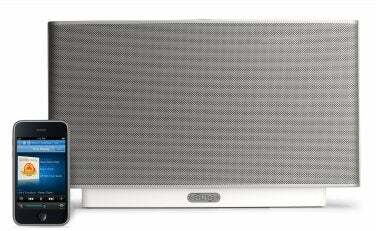 Whether it tempts you to join the Sonos family will depend, in large part, on how you like its sound. The S5 carries five speakers—a 3.5-inch woofer, two 3-inch midrange drivers, and two tweeters. Each speaker is driven by its own Class-D digital amplifier. On the back of the S5 you’ll find a 3.5mm headphone port; a 3.5mm audio-input port for connecting an analog audio source such as an iPod, portable disc player, or TV; and two Ethernet ports. You can use one for connecting the S5 to your router and another to deliver a network connection to your computer. If the S5 is connected wirelessly, you can use both ports for network purposes—one for the computer and another for a networked attached storage (NAS) drive, for example. On the top of the unit are volume and mute buttons. As with other Sonos ZonePlayers, the S5 offers no way to control playback. Rather, you use the free Sonos Desktop Controller application on your Mac, a Sonos hardware remote such as the Sonos Controller 200, or the free Sonos Controller for iPhone app. Via any of these controllers, you can use the ZonePlayer S5 to play music streamed from your music library as well as Internet radio and content from such services as Pandora, Last.fm, Napster, Rhapsody, and Sirius (subscription services such as Napster, Rhapsody, and Sirius require membership). You can consider the S5 from a couple of angles. If you already own a Sonos system, the S5 is a very simple way to add another room, speakers and all, to your audio system. Just plug in the S5, add it as a zone, and you’re ready to rock (or gavotte, depending on your musical tastes). The bass port on the back also acts as a recessed handle so it’s very easy to move the S5 from the bedroom to the kitchen to the patio. The S5 can also operate as a one-room Sonos system, but as such its movability is limited without the additional purchase of a $99 ZoneBridge. The Sonos system requires that at least one ZonePlayer, or a ZoneBridge, be plugged directly into a network router. If that router is in the back bedroom and you want the S5 in the living room, you’ll need to either run a long Ethernet cable between the router and S5, or bite the bullet and buy that ZoneBridge and plug it into the router. Do the latter and the ZoneBridge then acts as the bridge between your music library (hosted somewhere on your network) or Internet connection and any ZonePlayers in your home. When you latch on to a Sonos unit, you’re not just getting something that will play music from your iTunes library or a device you can conveniently jack your iPod into. It’s truly a music system. With it you can bring all your music together—whether on your computer’s hard drive, a network drive, or on the Internet—and play it seamlessly as if it were all stored locally. And there’s real value in that. Those who heard Apple's now-defunct iPod Hi-Fi understand that the one-piece music system is a tough nut to crack. It’s nearly impossible to get good stereo separation from such devices, and many of them deliver unbalanced audio. The S5 certainly suffers from the first limitation. All the music is there, but there’s very little space between the left and right channels. It does a better job with the latter, however. There are real highs and lows and plenty of music in between. Part of the low end comes courtesy of a Loudness option that’s on by default. But it’s not a cheat. Switch Loudness off using one of the controllers and the bass doesn’t disappear, you simply get less of the satisfying fullness. Which is a good thing: I found the S5 to be a little too rich on the low end. Fortunately, as with other Sonos ZonePlayers, you can adjust the S5’s treble, bass, and balance to your tastes. The S5 also has plenty of volume—crank it up and you can fill a large room with distortion-free music. Sonos suggests that you place the S5 within two feet of a wall—an old acoustic trick for bringing out more bass from speakers. The manual also recommends that you place the S5 across the room from where you’d typically listen to it. And that’s good advice—close up the S5 sounds too bassy. Good as the S5 sounds, Sonos can’t work miracles. The S5 sounds like a single box. As such, it makes a welcome partner in a larger home’s kitchen or den, but won’t replace a set of good quality speakers with a few feet of space between them. The Sonos ZonePlayer S5 has a lot going for it. For $399—just $50 more than a speaker- and amp-less ZonePlayer 90—you get a good-sounding box that delivers plenty of volume and easy access to all the music you wish to deliver to it. However, the requirement of a direct network connection (or a ZoneBridge) may not be convenient for those who don't already have a Sonos system. And not everyone will care for the S5's single-cabinet sound. For current Sonos system owners, it’s an obvious and welcome add-on. For those just starting out with Sonos, take advantage of Sonos’ 30-day “for any reason” return policy and see if you like what you hear. I’m willing to bet you’ll keep it.